Courage walks through the door of Rock Steady in many forms. Thomas Lamb, a physically fit, studious-looking gentleman with his hands wrapped neatly in red hand wraps, walks through Rock Steady’s door ready to do battle with Parkinson’s Disease. “When I realized I had Parkinson’s, my heart sank to my toes…my life is over, I thought,” said Thomas Lamb – Thomas was diagnosed with Parkinson’s 17 years ago. While the diagnosis was a blow to him at first, he soon regained his footing and made the decision to begin fighting back. A lifelong advocate of health and wellness, Thomas is doing all he can to combat his disease through vitamin supplementation, proper nutrition, stretching and exercise, voice therapy and stress management. With a degree in Clinical Psychiatry and 40 years of private practice in the treatment of anxiety and depression, Thomas is well aware of the importance of stress management, particularly for those living with Parkinson’s. Spirituality, loving relationships, creativity, self-expression and articulation are the most important things to him. 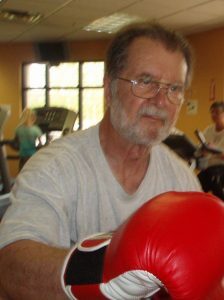 Thomas said, “I’ve been boxing at Rock Steady for four years…the exercise has definitely reduced my symptoms of Parkinson’s, and I am deeply grateful to Rock Steady. It has been a great blessing for me.” Rock Steady has empowered him physically, emotionally, nurturing him, and providing him a place of unconditional acceptance. From a trainer’s perspective, Thomas reaps the benefits of regular, intense physical exercise as part of an overall treatment plan in fighting Parkinson’s disease. His dedication and determination has not been lost on his family, as his daughter Melissa and grandson Austin also box and volunteer at Rock Steady (the family resemblance becomes clear when we hold hand pads for them and see the same “killer” instinct as when we hold hand pads for Thomas!). Thomas, and all of those who fight alongside him in his battle, are an inspiration and a blessing to their families, their communities, and their trainers. Keep fighting, Thomas… now DROP DOWN AND GIVE ME 20 PUSH UPS!